I regularly entertain people with all plant-based food who do not necessarily share my eating habits – usually with great success – and it’s a fantastic way to introduce people to the wonderful flavors, variety, and colors of plant-based meals. 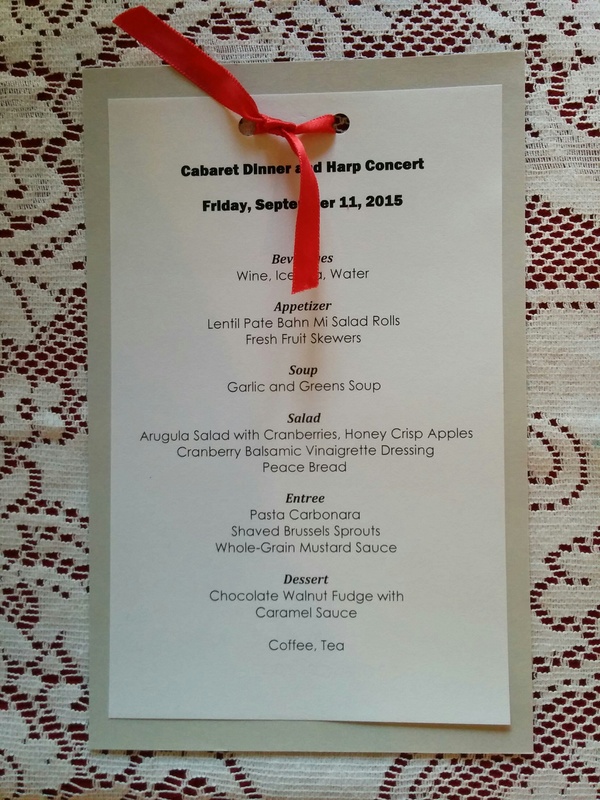 In this article I will be sharing recipes from a menu I recently put together and prepared with a co-conspirator as part of a charity fundraising dinner. There’s no need to do anything as extensive as this particular menu unless you delight in going all out – even one delicious dish can help to demonstrate what can be accomplished without using animal products. Find out early if any of your guests have allergies or food preferences you should watch out for. Nut, soy, and wheat in-tolerances are common and can be planned for – even if one person can’t eat everything you make – I consider it being a mark of an excellent host to try to make something for everyone that they can enjoy. 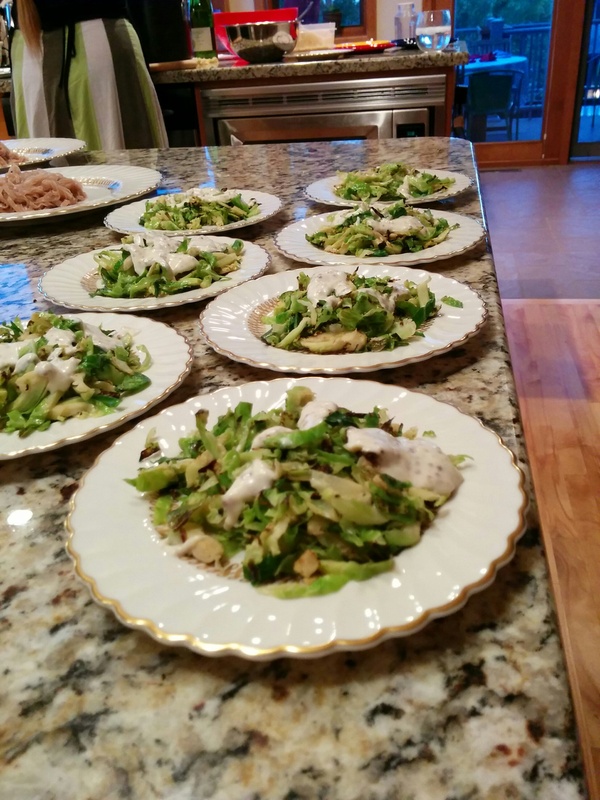 Sometimes you can easily alter a dish slightly just for one guest to accommodate them. Test your recipes at least once before making them for guests. I don’t always follow this one and it can make getting ready much more stressful than it needs to be. You may learn that there’s something in the recipe that needs to be adjusted to your taste – or than an ingredient in it is hard to find – or even that it simply takes too long to make. 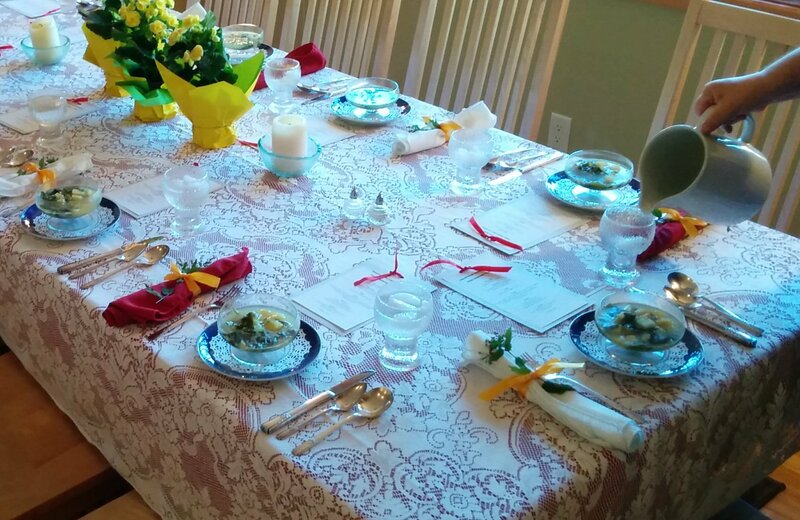 Presentation – While some people couldn’t care less about this – I think eating is more than a taste and scent experience – it’s also a visual one. Take a few extra moments to plate your items well and decorate when appropriate. Visuals make someone exited to take the first bite. 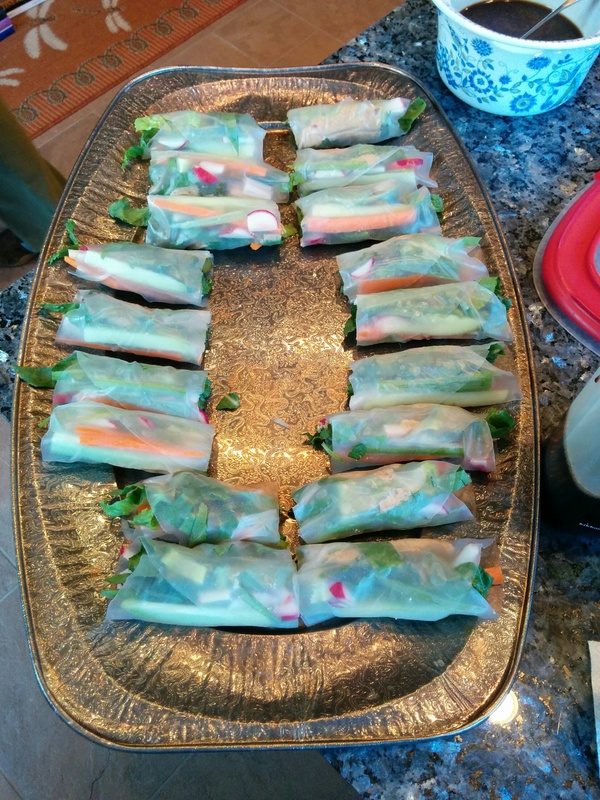 This recipe was my first ever attempt at using rice paper. I used a sushi rolling mat covered with plastic wrap to keep my rice paper from sticking to my work surface, but there are all sorts of creative solutions. 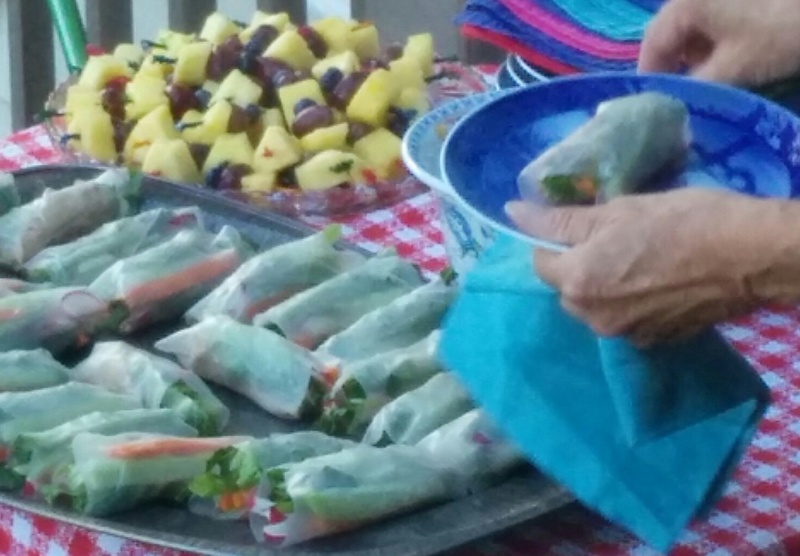 This recipe helped me add add spring roll creation to my food preparation repertoire and I hope it does the same for you (unless you are already a spring rolling master). This recipe also has some ingredients that can be more challenging to find. This is where you can 1) learn about where to find various ingredients or 2) use the subtle art of substitution and/or leaving out ingredients. The first time I made these I couldn’t find cornichon pickles – so I substituted a mildly sweet gherkin instead which worked just fine. I also used brown lentils instead of black. Really this recipe would be good with all sorts of combinations of veggies etc. Rice paper can often be found in the ethnic section of standard grocers – though Asian grocers, co-ops, and health food store are also likely suppliers. In the interest of full disclosure I do not include the cilantro when I make this recipe as I am one of those terrible cilantro haters – use to your taste. Make the pate first: In a skillet, saute the shallots in oil until golden. Then add the garlic and ginger and saute for 1 minute. Stir in the sherry, simmer for 30 seconds, and then add the thyme, mustard, and nutmeg. Turn off the heat and cool for 5 minutes. In a food processor, pulse the toasted walnuts into a fine meal. Add the lentils and sauteed shallots and pulse into a thick paste, stopping occasionally to scrape down the sides and bottom of the processor bowl. Add the vinegar, salt, and black pepper. Pulse again, then taste and, if necessary, season with another dash of vinegar or salt. Spoon the lentil paste into a mixing bowl, cover with plastic wrap, and refrigerate until completely chilled, at least 1 hour or overnight. When ready to assemble the rolls, prepare all of the salad vegetables first, then whisk together the sauce ingredients and pour into small condiment dishes. Fill a wide, shallow bowl with 1 inch of warm water for reconstituting the rice paper. Get ready to roll! Soften the rice paper wrapper by submerging it in the water dish for about 15 seconds, or until it’s softened just enough to bend; do not oversoak or the wrappers will easily tear. Gently shake away any excess water and spread the wrapper on a cutting board. Arrange on the lower third of the wrapper a few tablespoons of the shredded lettuce, a few strands of cucumber, carrot, and radish, a sprig of cilantro, and a scallion stem. Scoop up about 2 tablespoons of pate and work into an oblong shape. Press it onto the lettuce and then gently press a cornichon into the pate. Gently fold the sides of the wrapper over the filling, then roll up the wrapper, bottom to top, like a burrito. Serve along with the dipping sauce. *Sara’s note: My assembly process does not look like the above process, I spoon the pate in and just put whatever I think looks like the “right amount” of veggies inside – I cut the pickles in half so they aren’t in just one bite of the roll – and cut the whole spring roll in half for serving – the sauce was spooned over the rolls by the guests – be as precise or sloppy as works for you – soon they will be eaten and no one will know the difference except for you. Rolls are best consume within 30 minutes of assembling, but if packed in an airtight, dry container and chilled, they can be enjoyed a few hours later. By: Colleen Patrick-Goudreau, Source: The Vegan Table: 200 Unforgettable Recipes for Entertaining Every Guest at Every Occasion, There is also a free video online of the author demonstrating this recipe. It can be found here. As well as being simply delicious – this is my go to sick soup. I always make it when me or my loved ones are feeling under the weather. It’s full of iron rich greens, easy on the stomach, and though the scientific jury is still out – there is some evidence that garlic may help to fight infections. A garlic press is invaluable for this recipe – and for cooking in general, though you can make it without one. It’s one of the few single purpose tools I find truly useful in my kitchen with very limited storage space. In a large soup pot, heat 3 tablespoons water and saute garlic and onion until onion turns translucent about 5 minutes. Add greens (kale), potatoes, and remaining 8 cups of water to the soup pot and bring to a boil. Simmer everything together for 25 to 30 minutes until you can easily pierce the potatoes with a fork. Add the rice vinegar and salt and pepper to taste. Stir and serve immediately. Leftovers store well in the refrigerator for several days and also freeze well. This is an easy colorful salad to throw together that involves minimal chopping and tricks you into eating your greens while enjoying nuts, fruit, and savory dressing. 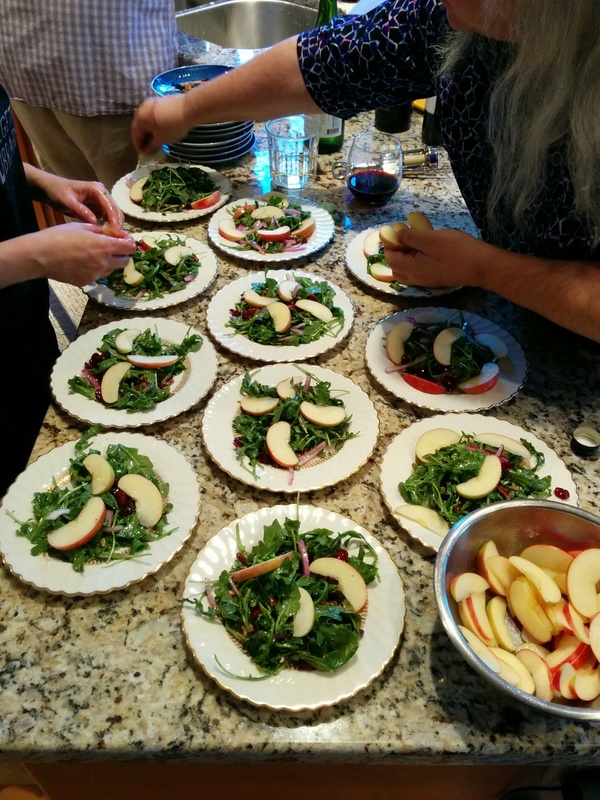 We used baby arugula that had been pre-prepped and washed which can be a great time saver. Now is a great time to take advantage of our wonderful apple selection in Wisconsin – but other seasonal fruits can be used as well. 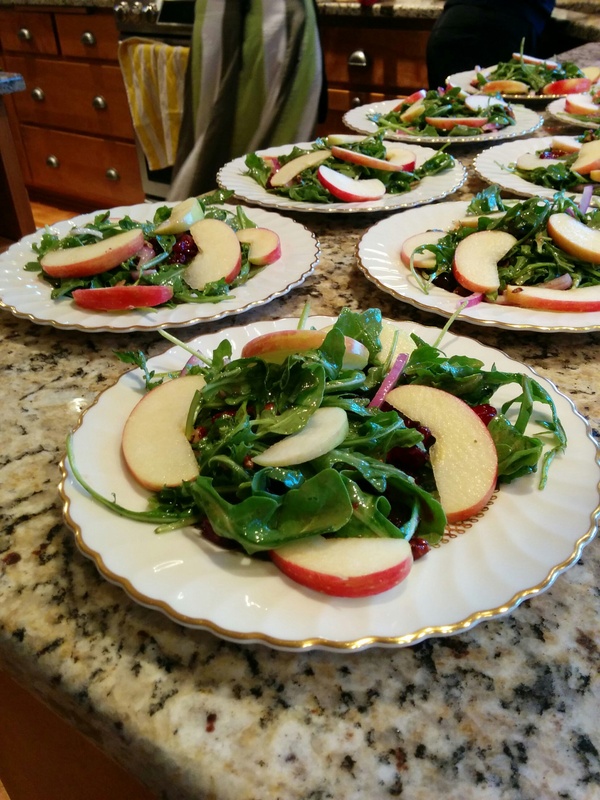 In a large mixing bowl, toss the arugula and red onion with the dressing until well coated. Top the salad with the sliced fruit or berries, cranberries, and pecans. Toss again. Sprinkle with black pepper if desired. In the bowl of a processor or a blender, combine the balsamic vinegar, cranberry sauce, salt, and pepper and process until smooth. As the processor/blender is running, slowly pour in the oil, creating an emulsion. Use immediately or store in a container or jar for up to 1 week in the refrigerator. Shake well before serving after storage. In a large stockpot over medium heat, cook the pasta according to package directions. Remove from the heat, drain, and rinse with cold water. Toss with the olive oil to prevent sticking. Return the pasta to the stockpot and set aside. In a large skillet over medium heat, warm the vegetable oil. Add the bacun and pay fry it form 2 to 4 minutes, until browned. Remove from the heat. Once the bacun is cool enough to handle, chop it into bits and transfer it to a small bowl. Set aside. In a large, heavy saucepan over medium heat, melt the margarine. Add the flour and cook for 3 minutes, stirring well to avoid clumps. Slowly add the vegetable stock to the saucepan, stirring constantly. Reduce the heat to low and let simmer, uncovered, for 20 minutes. 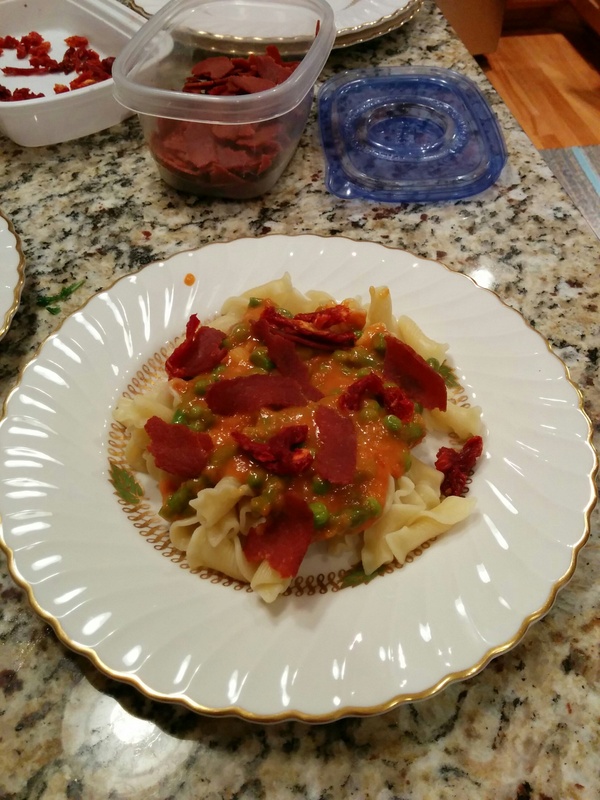 Add the 3/4 cup sundried tomatoes, soy milk, red pepper flakes, salt, and black pepper. Remove from the heat. using an immersion blender (or transfer to a regular blender), puree until smooth and creamy. Return to the heat (and, if using a regular blender to puree, the saucepan). Add the asparagus and peas to the saucepan and simmer for 10 minutes, until the sauce takes on the thickness and consistency of spaghetti sauce. Remove from heat. Transfer the sauce to the stockpot containing the pasta and toss well. You may need to restore to medium-low heat to thicken the sauce and really coat the noodles. The sauce should not be runny. Place 6 shallow entree-sized bowls on the counter. Place 2 cups of the pasta in each bowl. Garnish with the remaining sundried tomatoes and parsley. Book note: This book is from an all vegan restaurant in Philadelphia. They were Zagat’s highest ranking restaurant for 2014 in Philadelphia – not for vegetarian restaurants – out of all restaurants! I’ve just recently started working with this book, and after making this recipe I’m pretty excited about what other discoveries it might hold. *Note: I couldn’t find anything called “whole-grain” mustard at the store – What I ended up buying was Harvest Course Ground that had on it’s label that it was made with whole mustard seeds – it tasted great so I’m rounding it up to a win. To make the sauce, whisk together the vegan mayo, mustard, 1 tablespoon of water, 1/2 teaspoon of the salt, and 1/2 teaspoon of the pepper in a small bowl. Set aside. Heat the olive oil in a large saute pan over high heat. Just as the oil starts to ripple, add the garlic and the Brussels sprouts. Sear for 30 seconds, then stir to prevent the garlic from burning. Add the remaining 1/2 teaspoon salt and 1/2 teaspoon pepper, then allow the Brussels sprouts to sear for 4 to 5 minutes, stirring occasionally so they brown evenly. Lightly grease an 8-inch (20-cm) square baking pan with nondairy butter. Place the chocolate chips, butter, confectioners’ sugar, cocoa powder, vanilla, and milk in a double boiler. (Create your own double broiler by placing a small saucepan inside a larger pot that’s filled with 1/4 to 1/2 cup [60 to 120 ml]. Stir until the chips are melted and the mixture is smooth. Add the nuts, if desired, and quickly pour the mixture into the prepared pan. Chill thoroughly for at least 3 hours, then cut into squares. 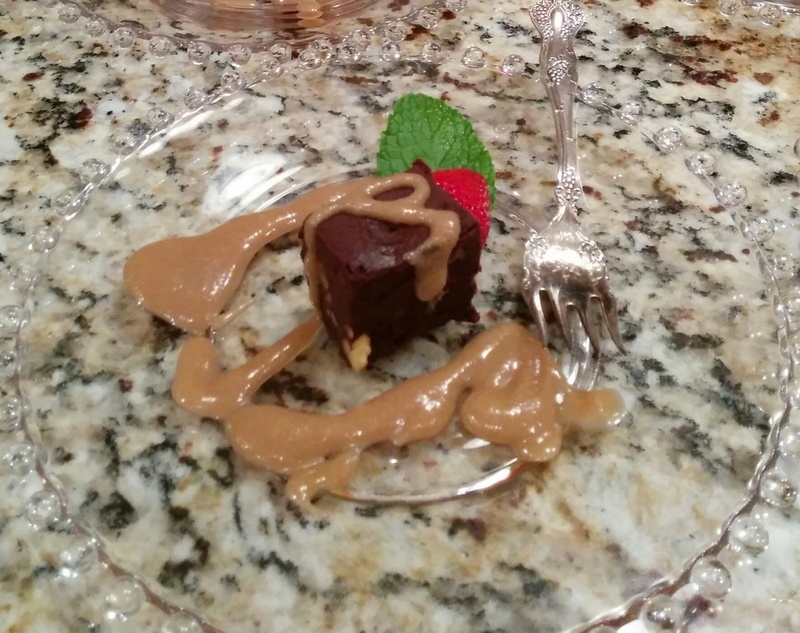 Find the recipe for the sauce used to decorate these delectable deserts here.